We all know that TM (Touch Mobile) is a cellular brand of Globe so it’s not hard for us to configure the access point name or APN settings on your mobile phone. If you’re familiar with Globe GPRS and APN settings you can use that as TM also uses same access point settings with Globe Telecom. To connect to the internet using your SIM card make sure to activate first your GPRS / 3G / HSPA / LTE connection by texting correct SMS keyword. You can also activate your new SIM by doing a manual configuration on your phone's access point settings, see step by step details below for your reference. Once you received the configuration settings, restart your phone. Do note that for Android and iOS users you need to add MCC and MNC value on your APN configurations. 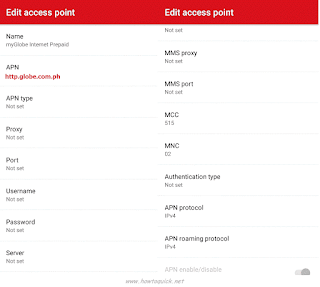 We provided link below on how to configure APN on your Android mobile as your guide. You can only avail connect to the highest network type that is available on your area. You may also use above settings to configure Android Manual APN Settings. For Nokia phone s40 phones who are experiencing error on connecting to internet related to "Subscribe To Packet Data First" see Packet Data error problem solution. api.facebook.com[java.net.UknownHostException] .. panu po yan maalis??? pag inaactivate ko po ung gprs nya eeh ayaw naman po laging error po ung lumalabas ? invalid keyword daw po ? pero tama naman ung tinatype ko ? cherry w120 smartphone po ung gamit ko ? Anybody can help me solve this problem? I'm heving a nokia C3-00 phone ,how can i play youtube videos on it?cause evrytime i search youtube and when i choose to play VIDEOS it says that ''SUBSCRIBE TO PACKET DATA FIRST'' how would i solve this?pls help. Pede din po ba magtanong ? nag txtx na po ako sa GO to 2951 tapos nag replay po probleme ko po wla po automatic save kasi unit ng CP ko po Samsung duos GT-C3312 pano po ba yun ? may nag rereply po na "Invalid keyword"
nung nag GO po ulit ako kasma ung model ng phone ko . invalid keyword paren . pano po yun ? Look at your keypad baka sira yan or namistype mo ang password. need some instruction about streaming settings on my phonne. pero diba po ung about sa post sa taas pareho lng sa globe ang net settings ng tm?i can search but still cannot play videos need further instructions about streaming settings,hehe. Sana magrep po kaio ulit at sa mga nagcocomment din don't be just silent reader if u know u can help me.hehehe. Mag tetenk u na ako in advans.:XD. Na reformat kasi tong phone ko sa Samsung Center, sinubukan ng pangkin ko na ma-unlock eh umabot na sya sa maximum pattern attempt. Ayun na locked! Ni-reformat. Di nako makapag surf sa mga promo na-availed like Facebook. Panung gagawin? HI! GOOD MORNING! PAANO PO PAG HUAWEI Y210? AYAW DIN PO SAKIN GUMANA ANG SETTINGS. Hi! I'm using an Xperia u20i or better known as X10 Mini Pro. I'm using TM so I subscribed to supersurf.. I'm trying to manually add the APN and sent the GO to 2951. It doesn't connect. Now I'm wondering how to fix this and I'm hoping that Globe/TM supports this phone. (My friends told me that maybe because they don't support the phone model eh) Any tips? Thank you! Hello po .. Nokia c2-03 po phone ko .. wala parin pong dumadating na config. settings sakin. compatible po ba sa phone ko yan ? Tm po ako,. Panu po gagana ang Browser ng Liber sa Cherry Mobile Thunder ko. Anu po ung mga dapat gawin. here's I think the same guide on how to activate you Cherry Mobile Thunder GRPS / 3G settings, just follow this Cherry Mobile Flare manual GPRS, 3G APN settings and activation ..if you're using other networks like Sun cellular, Smart, TM just change the APN details. HELP!!!!!!!! Cant connect fb... nag-manual config na po ako...then pag nag-try na ko mag Log-in laging Request Timed-out. na-install ko na po lahat ng config msg. bakit wala pa din po yung symbol na open yung packet data sa status bar ko? samsung galaxy GT-S5300 unit ng phone ko..
Hello po? Nabura ko po ksi yung settings ..ano po nang dapat kong gawin? Ksi po kailangan ko po ng new internet settings para po magamit ko yung 3g ko. Kso pagtntext ko po yung GO send ko sa 2951 .ayaw po masend ..
im using apple 3gs how can i apply this ? is it accurate in iphones ? To all TM/Globe user try this.especially for NOKIA S40 phones.Try to follow D instrutions above posted by Sir Bryan Gonzales,I am TM prepaid user.C3 phone ko. 3-Choose Settings only-continue-enter your security code-click ok then try waiting your phone to on. 6-before youll enjoy surfing be sure to register to surf promos. 7-to spend cheaper try to register to ASTIGFB promos thats what i'm doing. if u want to ask me i'm just oftenly in FB.Add me if u want. Ito na po ung manual settings ng phone koe,sa mga hindi S40 phone pasensia na po C3 kc gmit ko.hehe.try nio lng po kung puede din sa inyo. then press BACK 3 times. Activate all Account names or AN. yun lng poe. Sana makatulong to. :) FAQ-rep lng po ako pag may time ulit hehe. effective din ba yan sa sony xperia ion? Eh sa Nokia Lumia 510? Paano? pwede po patulong nabura ko kasi ung settings sa phone ko corby 2. ano po ba setting para maka net ulit ako? paano po ba mgactivate ng gprs sa lumia 520..?? Kuya pwede din ba yan sa cherry mobile flare? How to activate ng internet sa Lenovo A390_ROW. wla po kasi akong narecieve na settings sa 2951.
hot to set up the apn settings for Ip5? try nyo po keyword na GO N70,,1234 send to 2951 .... or you can go for this manual APN configuration Samsung Galaxy Y GT-S5360 GPRS MMS 3G Settings hope this help..
sir, how about my phone a818 duo?pwde po ba? pano po pag samsung sIII ang phone? how can i set it up? thanks po. Ano ba settings para mkapag fb ako. samsung s3 gamit ko. di maka connect lagi cnasabe " Authentication via the proxy server was unsuccessful. " makakapag access ba kung walang load?? pag nagtetext ako ng GO to 2951 nagrereply invalid keyword daw pano po yun pa help..
panu pu yon anu ba yung invalid keyword samsung GT-S3653 gamit ko.?? I can't install APN settings in my phone. Whenever I try to install it may lumalabas na "enter PIN". I don't know what PIN should i put. ako po huawei y210 ayaw sa net..free fb. Astig fb.bt gnun panu po un..
pano nman po pag sa myphone agua rain 2g d ko po pamagana pa help po pls. Hi po. Tanong ko lang kung Bakit ayaw gumana ng YouTube, twitter, at facebook apps ko? gamit ko po supersurf 20 at TMd Ang gamit kong SIM. response please po. thankssssss! how to activate mobile internet in sony xperia v.
2.5G nalabas sa phone ko katabi ng battery indicator ko ibig sbihin ba nun pwede nah ako mag fb kahit hndi 3G yung nakalagay? badly need your help po..ito po yung nakalagay sa internet profile settings. ahmm..can i ask?how to enable gprs in my phone using tm?my phone is cherry mobile snap.puhhleez. Kht mg load me ayaw p din. Wala xa mobile Internet?. panu po pag smartlocked iphone 4s na na unlocked lang using rsim? panu ko ma sesetup yung data connection??? oo nga, Pwede po ba sa iphone user to? Thanks! Ilang days or ilang hours ako maghihintay para sa reply nila? Hi! 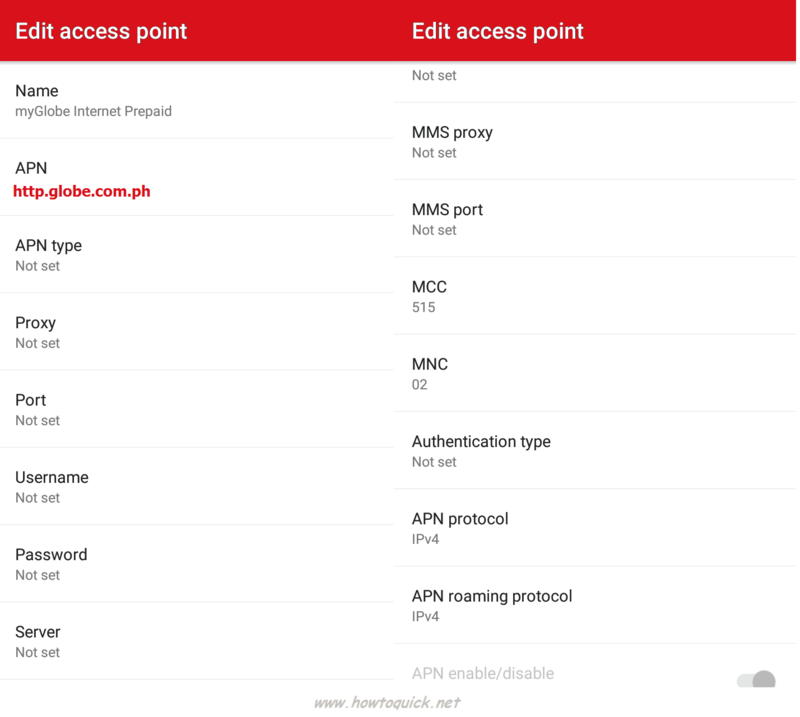 help naman po, I am using sony xperia ion phone the problem is wala akong access point I need sana the APN for globe prepaid kasi yun yung madalas ko gamitin. I've already tried the manual configurations but it's not working hindi ko na alam gagawin ko. I read the comments above yung activating pocket data na lang ang hindi ko natatry saan ko ba makikita yun? Paano po sa internet settings po sa TM po ang sim ko. How to activate it sa cel ko na Samsung Duos S7582? Salamat in advance! Normal po ba na matagal dumating yung configuration settings? Nokia 5130c-2 po ung cellphone ko. Patulong naman po for Samsung Galaxy A8. Thanks. Dati po kasing Smart user tapos ayaw nya mag-connect using Globe. Thank you.